Since 1945, UK energy policy has undergone seismic shifts as I set out in my first blog. Looking to the future, I think we will see more disruptive changes as we struggle to meet our climate change greenhouse gas emission reduction targets and learn to live responsibly (and happily) in a resource-limited world. In this endeavour, energy efficiency will continue to have an important role to play. However, it can only deliver its full potential if encouraged to do so through well designed policy instruments which support both innovation and behavioural change. For energy efficiency, and some would say more widely, we have yet to design a mix of market and interventionist policies which are fit for purpose for the 21st century and the challenges we face. If we don’t get that mix right, we risk being overtaken by events beyond our control. Knowing this, I read with interest a recent paper, which discusses how energy efficiency policies and programmes have developed in the UK and Finland respectively over the period 2000-2014. The paper also explores how the UK’s approach compares, or contrasts, with that of Finland. The evidence shows a continuation of the ebb and flow of policy interest in energy efficiency that has been the hallmark of successive UK Governments’ treatment of energy efficiency as part of energy policy, and in recent years as part of the energy/climate change mitigation policy mix. It shows a multiplicity of policies and measures implemented to greater or lesser effect. Their paper shows that there is still much to do. 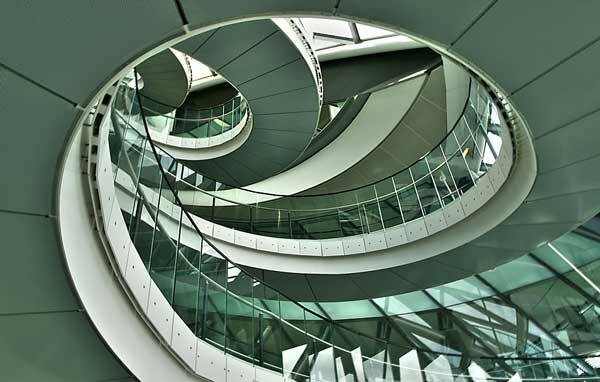 City Hall in London was built with its unusual shape in order to reduce the building’s surface area and improve its energy efficiency. Credit: Nick Garrod (CC BY-NC 2.0). Today, sadly, energy efficiency is, in my view, a lower political priority than it has been for a long time. It was more important in the 1980s (mainly to help reduce energy bills) and the 2000s (mainly to reduce energy bills and CO2 emissions; and to meet various EU Directives and regulations – e.g. the Energy Efficiency Directive, the Boiler Directive and the Energy Performance of Buildings Directive). The point the paper makes about the philosophy of different Governments, especially with respect to the role of markets to deliver policy outcomes, is, in my view, one of the factors central to the success, or failure, of Government actions to achieve energy efficiency policy goals. The team’s identification of the plethora of energy efficiency policy instruments, and the temptation to combine policy goals, are also relevant. Since the 1980s, there has been a lot of “churn” of energy efficiency policies and measures, more so than in other policy areas, in an attempt to achieve energy efficiency policy goals. Unfortunately, these policy instruments have generally been too weak to address the scale of the challenge effectively, and have not been allowed to run for long enough to build up a critical mass of success and interest in the marketplace. The consequence has been that publicly funded policy initiatives designed to stimulate self-sustaining market interest and activity have been less successful than Ministers and policy makers had hoped. It is worth adding here that churn in policies is not the only kind of churn going on. There is also a “churn” of policy makers. Policy makers move on to advance their careers. New and good, well-meaning but inexperienced people move in and start to design new policies under new Ministers who have their own views about which policy instruments they like the sound of and which are less attractive to them – irrespective of whether those instruments were likely to be more effective. On top of this, energy efficiency, and energy more generally, has been subject to machinery of Government changes too. Most recently these changes have culminated in the closure of the Department of Energy and Climate Change and the transfer of energy and energy efficiency policy responsibilities to the Department for Business, Energy and Industrial Strategy. As if the churn of policies, policy makers, Departments and Ministers are not enough, there is another challenge for policy makers. The paper refers to the absence of evaluation. There is no mechanism (at least during my time in the respective Departments which have been responsible for energy efficiency policy from the 1970s to 2001) for learning how well, or otherwise, particular policy initiatives have performed. Getting the mix of policy instruments right is only part of the process of achieving effective policy outcomes. Effective policy implementation is, in my view, just as important. Policy makers should regard their role as being not just policy formulation and scheme design but also to work closely with the respective implementing agencies to design ways to ensure effective feedback to inform policy makers. That means having a policy process whereby lessons can be learnt and policy instruments adjusted in the light of experience in order to make implementation as effective as possible. Yet, increasingly, energy efficiency policy implementation is at arms-length from energy efficiency policy formulation. In the early 1990s, the then Government set up the Energy Saving Trust, and in 2001 the Carbon Trust came into being. Both organisations designed and delivered a range of energy efficiency initiatives funded by, but at arms’ length from, Government. Following the end of Government funding for these organisations in early 2011, the energy companies have become the principal delivery agents for the Government’s energy efficiency policy, for example via the Energy Company Obligation (ECO) and predecessor schemes. So how well is that working? Well, let’s take a look at one specific element: improving the wall insulation of dwellings. We know from field work carried out by the British Board of Agreement and presented by their Chief Executive, Claire Curtis-Thomas, to a public lecture at University College London on 17 November 2016 entitled “Policy and perverse behaviours – understanding the landscape for large insulation retrofit projects” that the quality of wall insulation projects installed under the ECO is variable, to say the least. On the basis of this evidence, the effectiveness of implementation of this particular energy efficiency policy measure, and the estimated energy efficiency savings, are both questionable. This experience may be exceptional. Other ECO schemes may be achieving savings as intended. A key question to ask is what have been the results of independent evaluation of ECO schemes? The effectiveness of policy implementation is an area well worth exploring. The aim is not to embarrass policy makers and those responsible for implementation (they are different entities), but to help inform them so they can learn from independent evaluation, what works and what doesn’t. On innovation, the Sussex paper says “a rapidly fluctuating policy environment can slow innovation“. I agree. Stability of the (right) policy environment is what investors need in order to have confidence to invest in innovation – especially innovation for technologies for which market “pull” is weak. Where markets cannot deliver societal goods unaided, Governments have tended to see a role for themselves. How different Governments see and interpret that role has implications not just for energy efficiency but also a whole range of societal challenges from climate change mitigation to elderly care provision. I agree with the Sussex team’s conclusion that “there is an increasing interest in the effects of combinations of goals and instruments“. Combining policy goals needs careful handling because, without careful design of the policy instruments, it risks compromising the set of goals so that none is achieved in practice. “The introduction of social and carbon reduction goals into traditional energy efficiency ambitions” is a case in point. Tackling fuel poverty requires a different set of policy instruments from those designed to drive innovation in energy efficiency measures and technologies, for example. The paper includes a useful “comparison” dimension with Finland’s energy efficiency policies over that period. Comparisons between countries, approaches, policies and outcomes are useful, not just to academics but to policy makers and those interested in learning from the experiences of others facing similar challenges. The authors have developed an approach which could be used in other comparative analyses and I urge them to put their experience to good use as and when further research opportunities arise. Energy efficiency helps people, businesses and service providers make better use of the energy they buy and avoid paying for wasted energy. Second, in the event of supply difficulties, it makes the energy we have go further; and also reduces our energy imports bill. Third, it helps reduce our carbon emissions and thereby helps to meet our greenhouse gas emission reduction targets. In short, energy efficiency helps underpin the three elements of what has been UK energy policy for over a decade – affordability, security of supply, and reducing carbon emissions. It should be treated with the importance it deserves, and not left to sink or swim in the turbulent sea of market driven energy policy. Dr David Vincent is a former senior civil servant, who contributed to the development of the UK’s energy efficiency policies and programmes from the mid-1970s to 2001. He was the Carbon Trust Technology Director working on various energy efficiency and low carbon technology programmes and initiatives from 2001 to 2011. He is now an independent energy consultant, a member of the Sussex Energy Group and Centre on Innovation and Energy Demand’s Steering Group. Photo Credit: Jopa Elleul ‘[Explored] Mairie de Londres – City Hall of London‘. All Creative Commons.